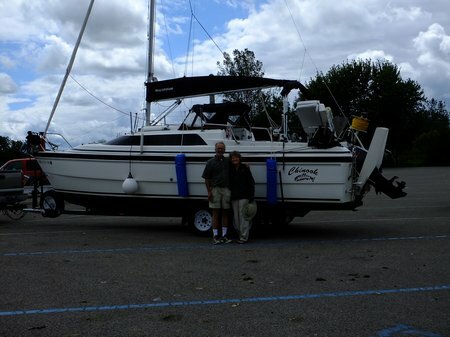 Mike and Sandy’s cruise around the American Great Loop, starting and ending at Grand Haven MI on Lake Michigan, from August 2015 to September 2016. 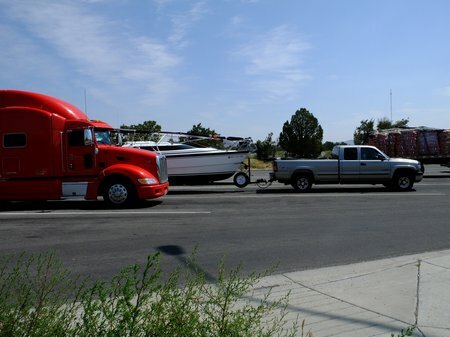 By this time, 4 weeks from now, we’ll be on the road, boat in tow and driving east across southern Idaho. Up until now it has seemed like the planning and preparation was in anticipation of a trip which might take place. The size of the “to do” list – daunting. The number of situations which could derail the trip – extensive. Now however, the checklist has way more things crossed off than yet to do. And barring a major surprise, little seems to stand in the way of actually going. It’s starting to feel real, which generates feelings of both anxiety and eager anticipation. From experience I know that the unease will abate once we make the lifestyle transition from traditional life at home to the transitory mode of life on the water. 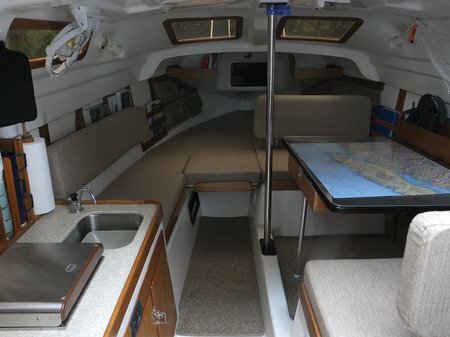 Boat preparations are complete, and Chinook is as ready as I can make her. All key systems are close to new and in good operating order. I’ve finally gotten the AIS radio to talk to the Garmin GPS, and have also established communication between the autopilot and the GPS. I’m looking forward to using both of those capabilities while on the Loop. The truck is serviced, and just needs a good cleaning, inside and out, before we ask her to do her work. We’ve begun organizing our clothing for a year of life on the boat. This is a major challenge as we examine closets and drawers full of clothing, trying to select wardrobes for a full year and fit them into three duffels. One will contain dress up and less frequently worn clothes, and will be stowed toward the back of the king berth. Two other duffels will be packed with day to day clothing as well as foul weather gear, and they will be placed at the front of the king berth just behind the companionway ladder. Socks, tee shirts and underwear will be stuffed into the pockets of the new organizers which hang on the sides of the vee berth area. In the remaining 4 weeks we will be visiting family members who, in some cases, we won’t see again for more than a year. We will also be pulling together contact information, passwords and other critical records which we’ll be bringing along with us. I’ve set up monthly bills on autopay, but I still need to prepare a list of semi annual and annual bills which will need to be paid. We have found a house sitter, but need to go over the details of how this place works before turning the keys over to her. And of course, there will be a lengthy list of last minute minor home repairs and house cleaning. August 15 will soon be at hand, but we’re confident that be ready when the big day comes. Only one more week before we pull the boat down our driveway and begin the road trip to our starting point on the Great Loop. We’re both becoming worn out by all the work which goes into getting ready for this major lifestyle change. 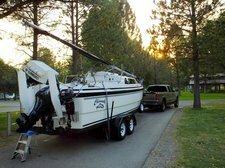 We’re on our 4th detailed checklist, which focuses on house cleaning, yard work, and yes, actually loading gear into the truck and boat. There are many last minute items, such as buying groceries and doing one final load of laundry. At times the thought of our actually doing this trip, leaving our comfortable home for more than a year and living aboard our little 26 foot sailboat, has really seemed unreal. Lately, it has seemed like we were doomed to a perpetual state of preparation. Exchanging a land based existence for one on water is greatly appealing in the abstract, however, the reality will only reveal itself with actually doing it. The whole thing became a lot more real for me this afternoon when I bicycled down to the local post office and turned in my change of address notice, with all mail after August 15 to be forwarded to son Ken. The time for talking and preparing is nearly over, and soon it will be time for doing. Things actually seem to be in pretty good shape for avoiding the usual last minute crush of things to do, and all the stress that goes with that. Perhaps because we’re going to be gone for so long, we’ve gotten a good jump on the big tasks, and we’re steadily whittling away at the little ones. Today we completed our final boat project, sewing up a new bug net for the companionway. This will be a really critical piece of gear, and it turned out very nice. It’s made of no-see-um net, with a perimeter of 1 inch nylon web tubing, into which we’ve stuffed bunches of oval lead slip sinkers. This weight helps hold the net into the sliding hatch track. Snaps and velcro at critical points help hold it in place. We’ve received the last 2 items which were purchased on line. I got a waterproof case for the smart phone, and had to buy new oar locks, since I accidentally broke the plastic pin off one of my dinghy oar locks. The new ones have stainless steel pins, which should be stronger and work with less friction. Sandy and I have both agreed that we’ll start no more new projects. We will complete our major yard work and house cleaning by this weekend, and then have next week for stowing gear in the boat and packing the truck. I’ll make one more trip to Wenatchee to renew the license tabs for the truck and boat trailer (they let you do this up to 6 months early, which works well for us). We both have hair cutting appointments. The week will pass quickly, and somehow, completion of the very last item of preparation will magically coincide with the departure date which we set more than 6 months ago. After more than a year of planning, and at least 6 months of intense preparations, we’ve finally begun our journey. The last week at home has been hectic and exhausting, trying to finish up last minute projects, completing several home maintenance tasks and minor repairs, doing some major home cleaning, and preparing the house for its hand off to our house sitter. We were up late on the last two nights, but by this morning, the house was in order, the truck and boat were packed, and it was time to leave. As we were stowing the last few items into the truck around 7am this morning, Sandy’s good friend Claudia spotted us while on her morning walk. She marched up our driveway to give us both big hugs and a hearty farewell. It was a great way to start. 7:20 am and we are underway. In the first 20 or 30 miles of a long trip our minds usually go through a sort of mental checklist, and every so often our stomachs tighten as we wonder if we remembered to pack some key item. However, we drive along without identifying any serious omission. The miles pass quickly as we drive down the Wenatchee River Valley, cross the Columbia at East Wenatchee, then drive down to the agricultural Columbia Basin, and then follow the Columbia River south, toward the Hanford Nuclear Reservation. As we approach the recreational community of Desert Aire we’re passed by an SUV, and we notice the couple in the vehicle wave enthusiastically as they swing back into their lane. We think they are simply admiring our MacGregor and drive along. However, after a couple of miles we notice that they are still right in front of us, pacing our speed. The car has Arizona plates. As the entrance to Desert Aire nears, they wave again and it hits us. They must be our good friends Mike and Karen, who used to live at Desert Aire but now live in Arizona. When they turn off we follow, and we both quickly park and jump out. What an amazing coincidence to meet like this while driving down the highway. We consider it a great indication of happy coincidences to come, as we start off on this trip. We reach our first milestone shortly before noon, as we cross the Columbia River into Oregon, at Umatilla. We stop for lunch at a rest area a short way beyond Umatilla, and then proceed onward across northeastern Oregon. Around Baker City the sky turns dirty brown – wildfire smoke. It gets so dense that cars are driving with headlights on. It stays like this all the way to the Snake River and our entry into Idaho. We’re now in the Mountain Time Zone, which means we lose an hour on our watches. It’s after 6pm local time when we finally pull into Three Island Crossing State Park at Glenns Ferry, along the Snake River. 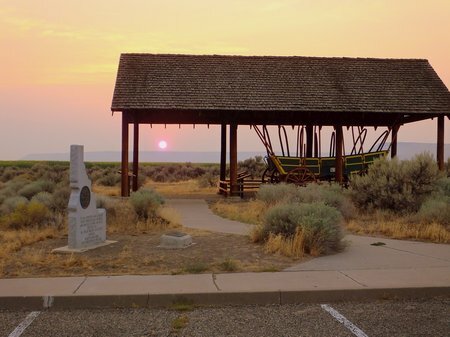 This is historic country, along the famed Oregon Trail. 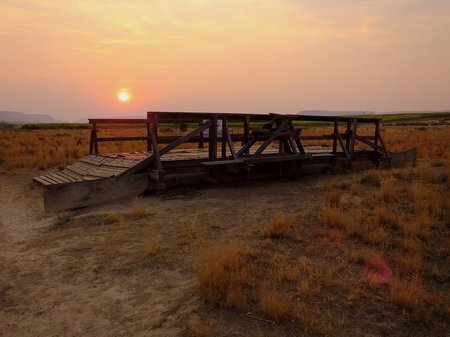 Wagon trains used this place in the mid nineteenth century to ford the Snake River, while on their way to western Oregon. The campground is green and inviting, with lush grass and tall shade trees, a welcome oasis after crossing the dry and featureless Snake River plain. As we’re setting up for dinner, we discover that we forgot to pack paper plates. Barbqued skirt steak is on the menu and we don’t want to marr our new plates with cut marks, so we hit upon the idea of heating up some flour tortillas and making fajitas out of the skirt steak. The dinner turns out great, and we’ve discovered a terrific new boat dinner idea. After dinner we go for a walk, over to the day use area and along a trail which leads to an old river ferry, marked by an interpretive sign. Quail and cottontail bunnies hang out in the brush, and white pelicans fly low over the river. It’s 10 pm local time, and the campground is not quiet. Temp is in the high 70’s, and the new fan inside the cabin feels good. Our upgraded companionway bug net went up easily, keeping the bugs out but allowing the air and sounds of the night in. We arise at 7am, an hour later than usual, but then, we’re now in a new time zone so we’re really being typical. As we prepare to assemble breakfast, we start discovering additional items inadvertantly left behind at home. The little pitcher of milk for breakfast cereal: still in the home refrigerator. A minor problem, since we have a spare pitcher and lots of powdered milk in the drinks provision tub. Next discovery is b bit more serious. It seems that Sandy’s new walking shoes, with her custom orthotics nestled inside, must still be in the hall closet, because they definitely aren’t in their custom shoe organizer pockets under the boat table. We don’t panic, though. I place a cell call to our house sitter, who confirms the whereabouts of the missing shoes, and arrange for her to send them via express mail delivery to our destination in Grand Haven MI. I suggest that Sandy keep a close eye on the skies above us in the next day or so, watching for a plane passing high overhead, and bearing her walking shoes. The drive itself goes smoothly as we leave Oregon Trail country along the Snake River behind us, briefly drop down into the Salt Lake Valley, and then weave our way through a narrow canyon toward Wyoming. Just past the border we are required to pull into an inspection station, where Wyoming Fish and Game officials inspect our boat for unwanted quagga mussell hitchhikers. These little mussels are an invasive species, which have infested inland waters in many parts of the US. Some states, including Wyoming, take special care to keep the pesky mussels from spreading further. The inspector recognizes our boat as a MacGregor, and in fact, he owns a MacGregor classic himself. 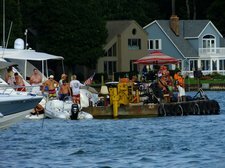 He knows all about water ballast, and asks us to both tilt our outboard motor down and open our water ballast valve. No water comes out, and we pass his inspection. He gives us a certificate and seals a small wire tag onto the front of our trailer, and then we’re off again. A short ways east of Evanston WY we spot our first pronghorn antelope. It’s virtually impossible to drive across Wyoming without seeing many of these beautiful and unique antelope. I read somewhere that over 90 percent of the species population live here in Wyoming. They are a welcome sight and provide something interesting to look for in an otherwise often bleak plains landscape. We begin seeing ample evidence of Wyoming’s contribution to fossil fuel engergy as we drive east. Tall stacks with gas flaring off, miles long oil car trains, and facilities I assume are related to oil shale production can be seen from the interstate. the south half of the interstate. Ordinarily, this arrangement would work fine, simply a 2 lane highway. However, no shoulder is available for the west bound traffic, and just past the start of the construction zone, a large semi has broken down in the middle of the west bound travel lane. A Wyoming state patrol officer is on scene and carefully directing traffic, including countless large semi’s, to creep slowly around the stalled truck, via a rather soft and steep shoulder. Naturally, this arrangement brings traffic to a near standstill. In our unimpeded lane, we merrily clip along at 65 mph. 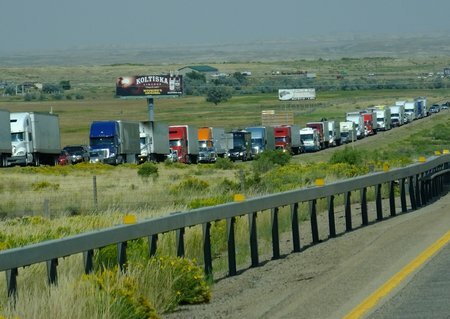 Westbound vehicles are bumper to bumper, either creeping along or completely stopped, for 12 miles. Amazingly, we encountered a similar traffic backup the last time we drove this route, in March 2011, while on our way to the Bahamas. The culprit that time was a westbound traffic closure at the summit, due to snowy conditions. I’ll think twice before I dare drive this interstate in the westerly direction. We’re now parked for the night at the Rock Springs KOA. It’s warm outside, and quite windy. The landscape is bleak, but we’re glad to be stopped for the night. Grilled sausages for dinner, a shower for Sandy and a quick swim in the pool for me, and we’re ready to call it a day. With the bleak high plains of southern Wyoming and the monotonous Nebraska plains looming ahead, we face the prospects of a long and likely boring interstate drive today. I rise at 6am, with the intent of getting a fairly early start. 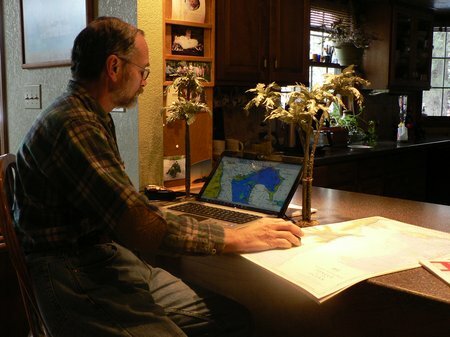 It’s quite chilly here in Rock Springs, around 45 degrees, so I fire up the stove inside the cabin, to warm things up. We eat a quick breakfast of cereal and pull out of the KOA at 7:40am. It’s clear and cool out, but without the stiff winds of the past 2 days. The landscape of southwestern Wyoming is arid and bleak, and for a long while we don’t even see any antelope. We cross the Continental Divide at an elevation of 6800 feet and drop into the Red Desert, a portion of Wyoming like the Great Basin of Nevada, where the streams have no outlet to the sea. We pass a vast open pit mine, probably coal, to the south of the freeway, and spot towering white plumes of vapor eminating from the stacks of the Jim Bridger Power Plant, which I assume is coal or gas fired. We cross Carbon County, and see our first operating oil well. Our route exits the basin near Rawlins, and we cross high plains to Laramie. We are now approaching the eastern fringe of the high plains, and as we begin to descend toward Cheyenne, we start seeing banks of low clouds, off to the east. We have seen this effect before, and I presume it is due to the warmer, more humid air of the lower Great Plains coming into contact with the cool, dry air of the high plains. The drop in elevation is noticable east of Cheyenne, and we descend into the cloud layer, eventually coming out beneath it as we cross into Nebraska near Pine Bluff. The forecast for today features a chance of thunderstorms, however, all we encounter is a light mist, just enough to operate the wiper blades. We make a quick fuel stop on the far side of Cheyenne, fix a lunch for eating on the fly, and drive on. The drive across western Nebraska is tedious and uninteresting. Like most places, Nebraska certainly has her beauty, however, I’m sure it’s best seen up close and at a slow pace, as in walking along a stream or resting in the shade of a cottonwood tree. Cruising along at 70 mph on the interstate, with featureless cloud cover overhead, is certainly not the best way to appreciate Nebraska. The heavy semi traffic and frequent construction zone slow downs don’t help things either. In addition, we cross into the Central Time Zone, which means we’ll arrive at our eventual destination an hour later by the clock. I consider stopping at North Platte, however, opt to continue on to Kearney, where the map shows a State Park campground. Our Google Map app on the smart phone routes us right to the place, and it turns out to be a pretty area, with lots of vacant camp sites scattered out along the margins of a series of small lakes. We finally arrive at 6pm, local time. The place is lush with grass and nicely spaced shade trees. We back into a spot and set up for the night. Tomorrow we’ll take it easy, with a much shorter distance in mind. With a shorter distance to go today, our start this morning is a bit more leisurely. We take time to heat up and enjoy a cinnabon roll we picked up at a truck stop yesterday. We roll out of the campground around 9am, under gray and threatening skies. The forecast calls for a 30 to 40 per cent chance of thunderstorms today in the country we’ll pass through. Furthermore, some of the storms are expected to be severe, with the possibility of tornadoes. This is very unusual for August, and it has me somewhat concerned. 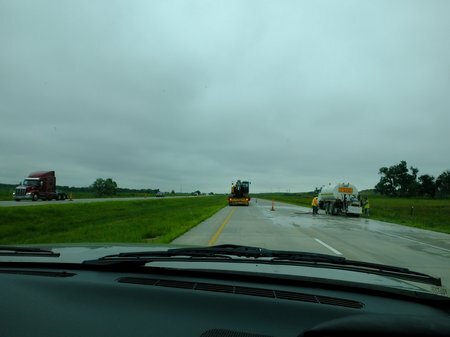 The flat farmland of Nebraska rolls on by like yesterday, but the driving gets complicated with the onset of rain near Lincoln, and by increasing traffic between Lincoln and Omaha. 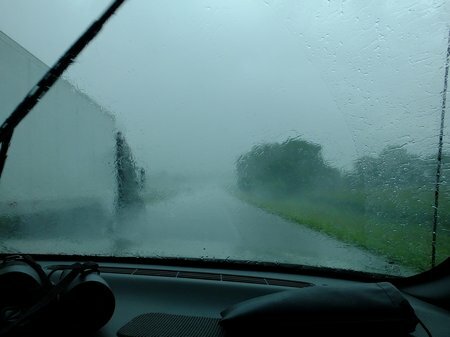 The rain becomes progressively heavier as I negotiate I-80 around Omaha. We cross the Missouri River shortly before noon, and upon reaching the Iowa side, the landscape quickly changes. 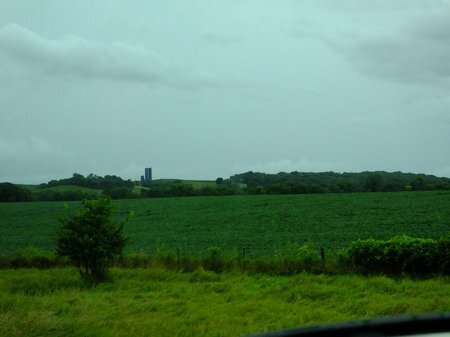 In place of the flat plains of Nebraska, western Iowa is very hilly and rolling, and the farms which have developed on its rich soil are delightful to behold. Vast corn and soybean fields are contoured into the hills, resulting in interesting patterns. The farm buildings and homes look prosperous. Some enterprising farmers have taken advantage of strategic hilltops to lease billboard sites. In one field next to the freeway I spot a “Burma Shave” style series of signs which appeal to the urban planner in me. They read: “Urban Sprawl” / “Ain’t very Purty” / “Save our Farmland” / “Build in the City”. These signs are sponsored by the Future Farmers of America. I heartily endorse their sentiment. As we near our intended destination, Rock Creek State Park, about 40 miles east of Des Moines, we travel into driving rain. We opt to go a couple hours further east, to a private campground located just 20 miles outside of Davenport. We arrive shortly after 5 pm and are pleased with our decision. We’ve driven out of the rain (for the moment at least). The place looks attractive and will suit our needs. I dry off the picnic table and we have our dinner of grilled sausages outdoors. It starts raining again, just as we finish eating, so we go into the boat for our dessert, a couple of ice cream bars purchased at the campground office. I call our friends in Grand Haven to let them know when to expect us tomorrow. It looks like we should be able to get there by around 3pm, if things go favorably. We’re up early, and enthused over the prospect of our final driving day. It’s partly cloudy and breezy, and the air is cool. We eat a quick breakfast and, while getting the boat ready to roll, a lady swings by and says she’s posted us in Facebook. 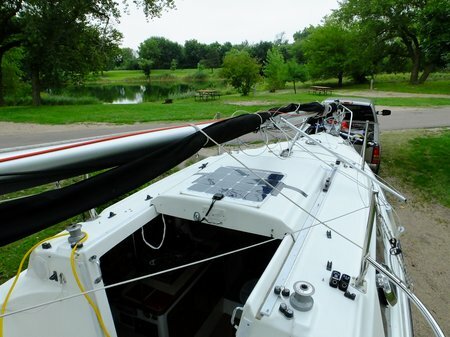 Apparently, camping in a sailboat isn’t all that common in this part of Iowa. We pull into the nearby truck stop and fill the tank, so we won’t run low on fuel as we drive past Chicago and make our final approach to Grand Haven. We pass through Davenport Iowa after a half hours drive, and then roll across the Mississippi. From here on in, we figure we’re in the eastern US. 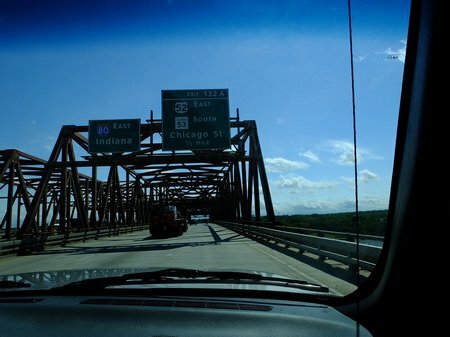 A short distance before we reach Joliet we take our first and only sightseeing detour of the drive. We’ve been paralleling the Illinois River, and I want to drive down and get a look at the waterway we’ll soon be cruising down in our boat. We drive down through the little river town of Marseilles and stumble onto a very recently built memorial to the Mideast Wars, which is located right on the river’s shore. The grounds are nicely landscaped, with a flag pavillion and memorial wall with the names of fallen veterans. 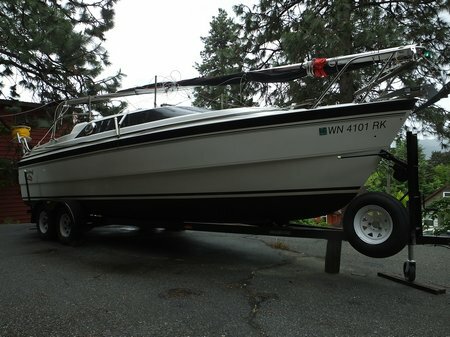 We photograph the boat on its trailer, with the river beyond. 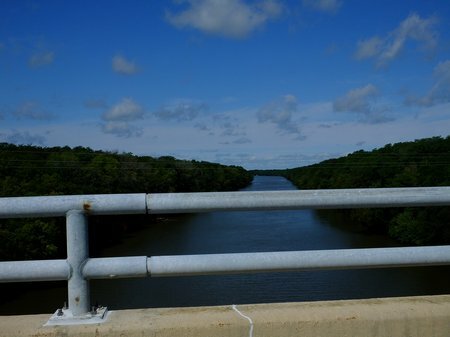 Soon after returning to the interstate, we actually cross the Illinois River at Joliet, and we shoot pictures of our upcoming route from the freeway bridge. To say that the drive around the south edge of Chicago is hectic would be a major understatement. Traffic volumes build, extra lanes appear, and we cross major interstate routes linking Chicago with places like St. Louis and Memphis. I know it’s coming, but I still resent the fact that I have no choice but to stop at the upcoming toll booth and come to a stop to pay a toll for the privilege of driving an unavoidable 7 miles of interstate, just short of the Indiana border. My toll only comes to $2.60 but it’s the principle of the thing, having to come to a halt on a “freeway” to pay that silly amount. I feel like I’ve been robbed at gunpoint by a little punk with a capgun. A short distance past the toll booth we encounter a lengthy construction zone, which means we lose a lane and have to weave back and forth, right next to the concrete barrier. With semi trucks crowding in alongside at 65 mph, I just barely squeeze through. We finally clear the Chicago area. There is absolutely no place to stop for lunch, so we munch on snacks within easy reach in the truck cab and motor on. Rural landscape and reduced traffic volumes go hand in hand. The top if Indiana goes by quickly, and early afternoon finds us finally in Michigan, driving north and paralleling the shore of Lake Michigan. We know it’s over there on our left, but we never get a peak at it, since the tree covered dunes obstruct the view. We’ve lost another hour by when we crossed into Michigan. At 4pm Eastern Savings Time we arrived at our friends’ house in a little town just outside Grand Haven. Their greetings are warm and heartfelt. We are so relieved to have completed our drive. After 2,355 miles we have successfully towed our Great Loop boat to its starting point. The wind is gusting when we get up this morning. The forecast calls for 30 knot winds and 9 foot waves on the shore of Lake Michigan. This is definitely not typical August weather for around here. Our friends fix us a hearty breakfast, and then we drive down to the boat launch ramp on Harbor Island. Along the way we stop for a final fueling of the truck, and I fill the boat’s gas tanks, including the 5 jerry cans I’m carrying to provide us with additional cruising range (three 2.5 gallon cans stow under the steering seat, and another 2.5 gallon can and a 5 gallon can ride on the port side stern platform). 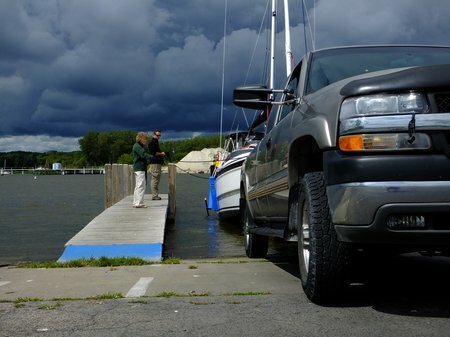 We drive to the launch ramp and begin the task of rigging the boat. It has always been my goal to do the perfect set up, with no mistakes or wasted effort. Once again, this highly desirable goal eludes me. 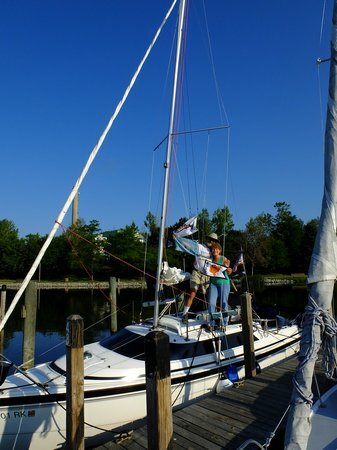 After raising the mast part way up, I realize that I’ve forgotten to pin the top of the forestay (I undue it for road travel, since this allows me to strap the furled jib to the mast without having it lay in a curve on deck). This results in me having to lower the mast back down, unpin it from the step and roll it back to the bow pulpit so I can reach the fitting where the forestay needs to attach. The setup process is further complicated by the fact that we’re doing this in nearly gale force winds. 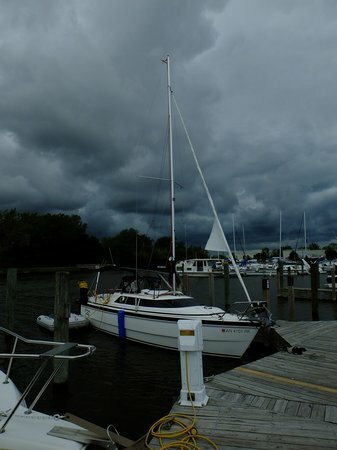 The wind is simply howling as we labor to rig the boat. I subconsiously find myself working a little slower, hoping that the wind will ease off when the time actually comes to launch the boat, however, we have no such luck. Around 2:30pm I back the truck down the ramp, and Chinook gets her first taste of Lake Michigan water. 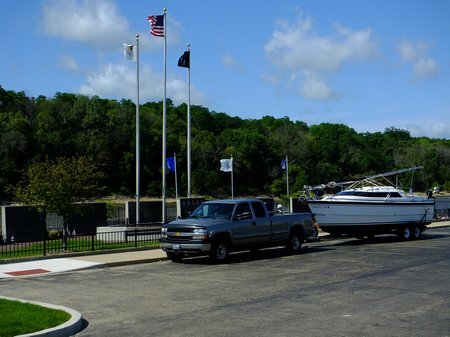 It’s all my dock line handlers can do to hold the floating boat close to the dock while I pull the truck back up the ramp and park. I lower the engine and rudders, but don’t have enough depth for the centerboard to go down. I turn the Garmin on and start the engine. Our friends work the boat out to the end of the dock with the docklines, which is a real struggle since the 30 knot wind is pressing broadside on the boat. Finally, it’s time to release lines and leave the dock, for the first time on our Loop cruise. I go in strong reverse to keep us from swinging around, against the next dock. 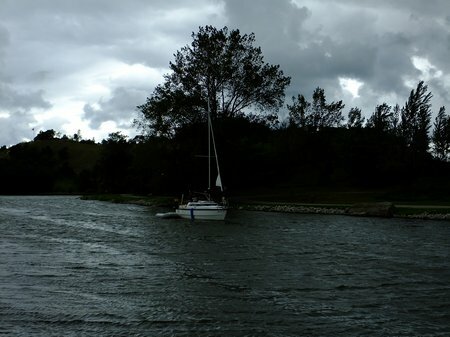 I continue backing into the wind until I have enough space to shift into forward and swing around, into open water. About this time I realize that I really don’t have a clue which way to go in getting to the municipal marina. 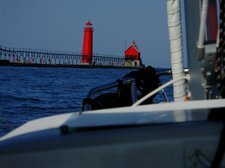 Sandy goes below and pulls out the Great Lakes Waterway Guide and looks up Grand Haven. I conclude that I have to take the channel to port. We’re headed straight into the wind, which is howling off the lake, and I’m dreading the prospects of trying to pull into a slip in these conditions. I radio the marina and get directions to our slip. Our friends are waiting there with our camera to document our docking. I’m hoping I don’t provide them with a full blown disaster. A marina employee is at the end of our slip, ready to help with our line, if we can simply get close enought to pass it to him. I make a wide circle so I’m heading bow into the wind, and try getting into the slip. 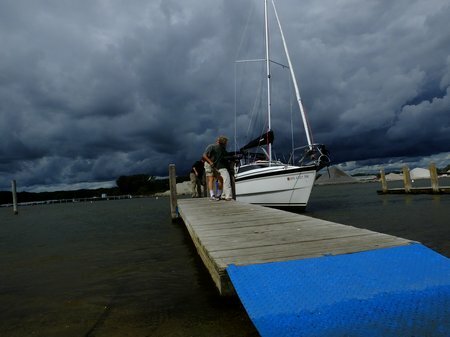 At the last moment we get slammed by a tremendous gust of wind which threatens to slam the side of our hull into the end of the dock. I jam the throttle into reverse, thankful for the power in my 60 hp engine. I pull away and circle for another attempt. This time I ferry over in the wind in good position to enter the slip, then give a shot of power to counteract the force of the wind, get turned into the slip, and then reverse to avoid ramming the bow into the walkway. It all works out perfectly and with great relief I hand the stern dock line to the marina attendant. We’ve successfully completed the first mile of our Great Loop Cruise.